Although its roots are military the AR-15 platform is quickly becoming one of the USA’s most popular hunting rifles as well. In the standard .223 caliber it’s ideal for small varmints and predator control. The AR-15 is a reliable, light and inherently accurate weapon. When paired with the right accessories, it’s perfect for the job of bringing down a wide range of game. One of the most important accessories is finding the best AR-15 scope depending on how you plan to use your rifle. If you are the type of person that likes to skip a detailed read and get right to the point, we’ve picked out our nine favorite AR-15 optics for you and condensed them into the grid below. If you want additional details, we’ve put together a comprehensive MONSTER guide that looks at 23 different optics in depth. Our buyer’s guide and top picks are sure to put you on the right path to picking the perfect scope to pair with your AR-15. Now that you’ve seen our three favorites in every category, let’s dive into some additional details. Feel free to use the table of contents to jump to the section of choice if you know you want to skip ahead. Other wise, please kick back and enjoy the read – it’s a long one. Before we get into our buyer’s guide, let’s make sure you are up to speed on scope basics. While we have some expert shooters that spend time on our site, many of our readers are also beginners who are very new to hunting/recreational shooting. We want to make sure that you understand how scopes work and how they can help you when properly paired. Let’s jump into some rifle scope 101. Look, numbers can be confusing. Some of our editors here have a hard enough time figuring out how their electric bill is calculated, let a lone magnification power of a scope. Here’s are what the numbers mean when you are looking at optics choices. Power: The power of the scope is how far out you can see your target. Power is the first number you see when you look at scopes and you see a couple numbers and a multiplier. Common numbers you may notice are 3×32 or 1-6×24. The 3 or the 1 in both series are the “power” of the scope. Higher numbers mean that the scopes are higher in power and give you maximum shooting distance. If the number is a variable (like 1-6) that means that you can vary the power of the scope giving you a much bigger range of power you can operate in versus a straight 3x or 4x. This is called variable power and is very common in today’s optics. It may also comes with a slightly higher price tag than non-variable scopes. Lower powered scopes are great for short to medium range hunting or operational range, while longer distance shooting will require a higher distance scope. Objective: Scope objective is the second number in that series. A variable powered scope of 1-6×24 provides a 24mm objective. Objective is always measured in millimeters and this refers to the lens size. Larger numbers mean bigger lenses. Bigger lenses are good for wide fields of view at a distance. They also allow for more light making them good low-light hunting partners. Unfortunately that also makes them bulkier and should be taken into consideration if you plan to hunt at longer distances with your AR-15. 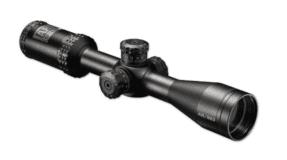 Some scopes come with adjustable objectives making them easier to to focus at longer distances. You can adjust what’s called the “parallax” which will let you fine tune your target at a much greater distance. Parallax is usually only something you need to worry about when your power is over 10 and most scopes underneath that threshold have a parallax that auto-adjusts. Reticle: The reticle of your scope is what most people refer to as the crosshairs of the rifle scope. It’s what you use to aim and point the gun at before firing. Red dot scopes have a red dot reticle and green dot scopes have a green dot reticle. You get the idea. MOA: MOA stands for “Minute of Angle.” MOA is an angular measurement that gets bigger with distance. MOA is something that professional shooters use to ensure that their groupings are extremely tight together and usually has less applicable use for casual hunters/shooters. 1 MOA is equal to 5 inches at 500 yards. Someone with a perfect MOA can shoot a one inch group at 10 yards. The easiest way to think about this is the spread of three of the closest shot holes out of a 5/10/20 shot group. Eye Relief Distance: This is how far you can hold the optic from your face comfortably while aiming. Keep in mind, AR-15s do have some recoil, so you want something that gives you enough room for kick-back so you don’t smack yourself in the face like the guy below. Navigating the sea of optics can be extremely confusing. When it comes to buying the AR-15 optic of choice, the old saying of “you get what you pay for” is as equally true here as it is for just about any other type of shooting gear. 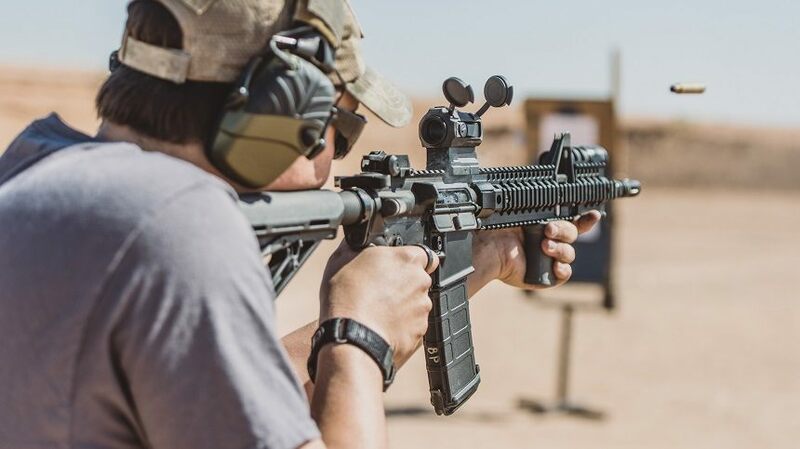 Even with cost being a significant factor, there are several things that you should consider before equipping your AR-15 with the newest technology. We break it down into six sections of what we feel is most important when selecting an optic. 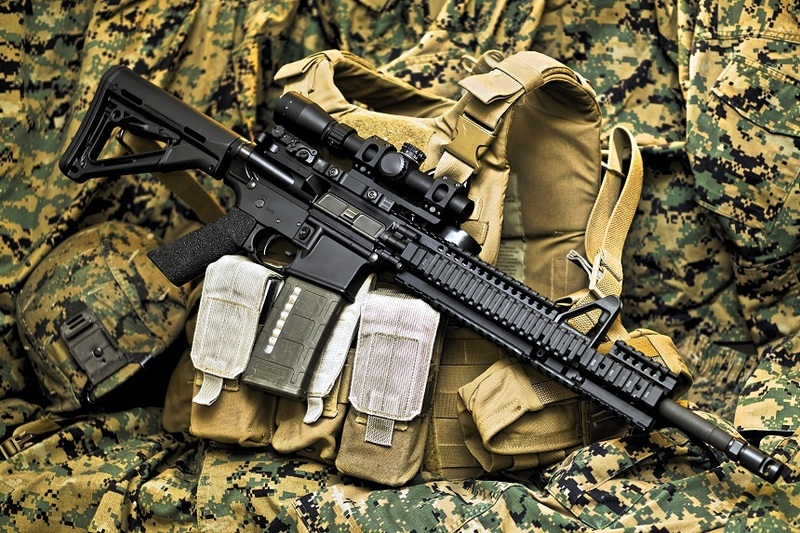 How you use your AR-15 will impact how you equip your rifle. The first thing you should be thinking about when buying an AR-15 scope is what your intended use is. Someone who is going to go out hunting with their AR-15 on a regular basis is going to have a far different need than someone who’s in the military or law enforcement. For some types of hunting and other tactical uses, you won’t even need a scope – a red dot unit, or even iron sights, are perfect for short-range critter blasting. For longer range, you’re going to need the precision that only comes from a set of good optics. Scopes themselves come in two basic styles; compact military-type optics, many of them specifically designed for the AR-15’s military cousins, and more traditional hunting scopes. They both have their strong points, with the military ones being tougher but hunting scopes offering better light gathering and, usually, more precise aiming systems. 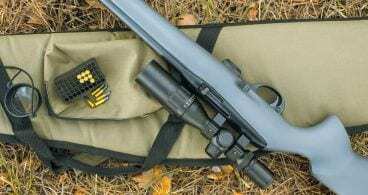 What suits you depends on your planned use; a traditional scope makes a good all-rounder and has real advantages over open ground, but for controlling critters or hunting in the woods a compact tactical unit makes a lot of sense. Optics are not universal. You need to plan for how you intend to use your rifle and sometimes owning multiple scopes makes sense. 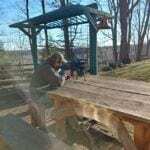 if you intend to use your rifle for tactical urban warfare drills in a survivalist training camp, a Red dot scope like an Aimpoint or a holographic scope like an EoTech are going to be your best bet. Even for short range varmint hunting, a red dot or holographic sight is perfect. For longer range, you are going to want to stick to something that has variable magnification settings that you can adjust depending on your windage and elevation, just like other long range rifle scopes that may outfit a 30-06 or a .308. Bottom Line: If you are a short distance hunter, go with a red dot scope or even a good set of flip up iron sights. 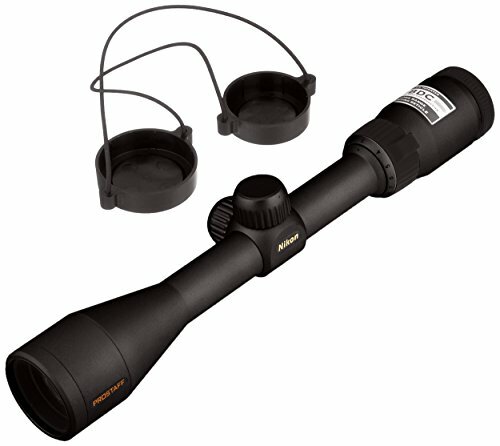 Long distance hunters should buy the best distance scope they can afford. Your Budgt Will Obviously Impact Your Optics Choices. Let’s be realistic – budget plays into everything. If you have the budget to spring for a Leupold Mark 6, it may be one of the most important purchases you can make for your AR-15. Leopold consistently competes with bigger american companies like Trijicon. If the scope is the most important part of your rifle for you – then sink your money into it and let the scope reward you for the next 15 years. If you are on a budget and don’t care where your scope is made, then it may be hard to justify spending over $500.00 on a scope. The good news is that there are still some really quality scopes that you can pickup for a budget under $500.00 and save that extra hard earned cash for additional rifle equipment or even other firearms if you are just starting out. Make no mistake about it, the Trijicon and Leupold scopes are some of the best quality optics that money can buy. But…if you don’t have a lot of experience with firearms, you are better off spending that money on additional ammunition. You may also look into picking up a smaller practice rifle like a Ruger 10/22 to help you train. You will get far more out of your rifle if you practice with it repeatedly and get more comfortable with some traditional iron sights. 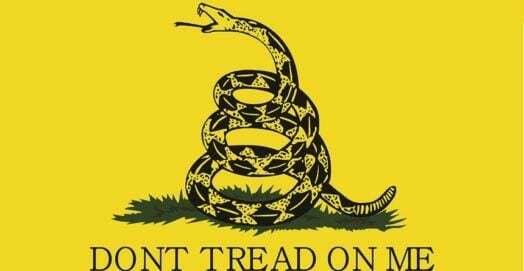 Bottom Line: If you’ve shot less than 1,000 rounds through your AR-15, your budget should be $500.00 or less. Your skill level will also impact what type of optic you should buy. Skill level is something that many beginners often overlook. They want to go out and buy the hottest scope on the market for their new “tacti-cool” AR-15. The history of the AR-15 goes deep and the reality is that they are probably better off getting to the range and practicing with Iron sights for a couple hundred rounds before thinking about what kind of optic to invest in. While we talked about budget – skill level makes a huge difference as well. Someone that’s shot 200 rounds through their first AR-15 should be only looking at budget friendly options. 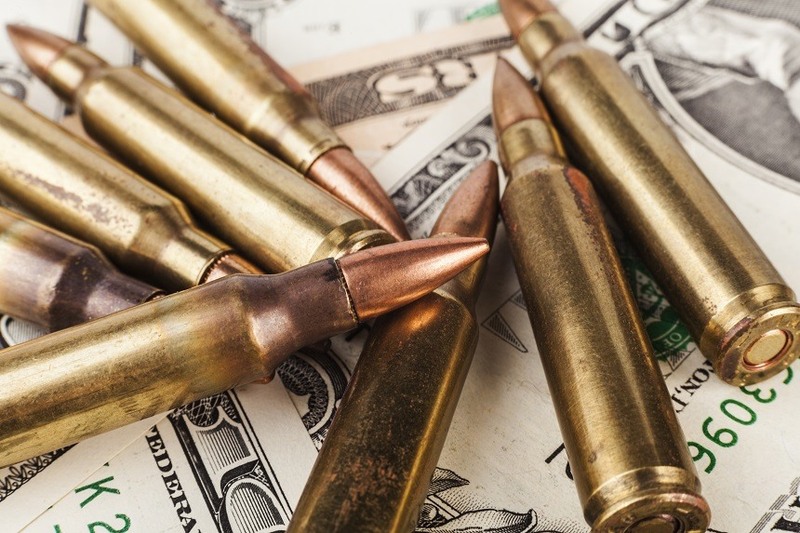 If you haven’t shot more than 1,000 rounds through your AR-15, you should be thinking of spending less than $500.00 on your scope and sinking the rest of the money into ammunition so you can practice and get really good with your rifle. For folks aren’t intermediate shooters, sticking with a mid level scope for distance or short range is a great idea. Stick with a Nikon for longer distances or an Aimpoint/Vortex product for shorter distances until you’ve worked your way into the shooting range at least 30 times with your AR-15. We mentioned it in the budget section, but beginners will get the most mileage out of their optics choices if they get really good with Iron sights to start with. Once you are comfortable hitting a target regularly with iron sights, then spending big money on quality optics can make a lot of sense. Bottom Line: Beginners should spend more time at the range and less money on optics. You’ll want to buy the optic with the features that you’ll need. Features are another area of consideration that you should be thinking about. Not all scopes are created equal. Features can sometimes trump budget if you are buying your scope for a specific purpose. This is where it can start to be justifiable to spend the extra money. If you are going to be operating with your AR-15 in low light areas, you will specifically want a scope that’s designed to let more light in to make the field of view much easier to see. 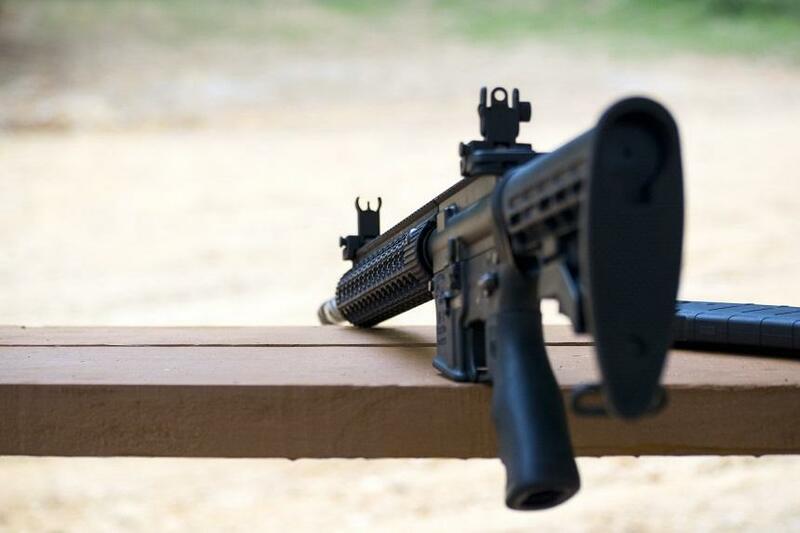 If you are planning on only using your AR-15 in the daytime, you have a little bit more latitude. Again, you can even stick with iron sights if you plan to do some closer range hunting and don’t need anything for distance. 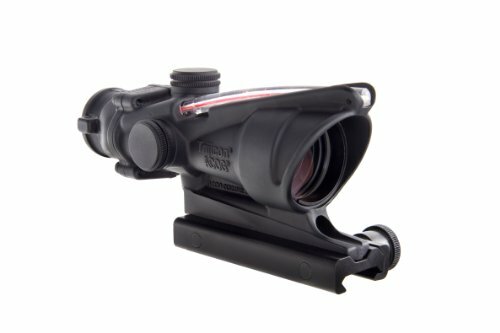 If buying a red dot scope makes sense for shorter distances, you’ll want to get a quality brand that has a good reputation for producing scopes that have a clear reticle which is easy to see when aiming at your target. If you are looking at a red dot scope, the good news is that you can also purchase magnifiers to make the dot extend in distance to more clearly see things further out, lessening the need for multiple optics. It’s worth noting that a lot of magnifiers won’t leave enough room on your AR-15 if you plan to run iron back up sights or flip up sights (BUIS). Again, you also want to consider that you may end up buying more than one type of scope for your needs. If most of your shooting is short-medium range, spend your money on a scope that can help you comfortably hit targets in that range and spend less on a long distance scope. Bottom Line: You get what you pay for. Depending on your planned use, some features may be worth more to you than others. Some gun enthusiasts prefer optics that are made in the USA, even if they are more expensive. Let’s face it – some people get pissed off when you mention buying anything manufactured overseas. People will say that the glass Nikon uses is “complete crap” or that UTG scopes are a “complete waste of money” because the glass used is manufactured in China and it’s all junk. Look, we get it. But at the end of the day, sometimes people on a budget want a little bit of an extra edge. A Bushnell, UTG or a Nikon can all be extremely versatile scopes for the money in a sea of versatile products for an AR-15. Are they at the same quality of a Trijicon or a Leupold? No. But that doesn’t mean there isn’t value here for lesser experienced shooters just finding their way at the range. If you are a competitive shooter, you have no business in the budget section anyways and there’s a good chance you’ve already found the best AR-15 scope for your planned use. Buying a cheaper product that’s made overseas by a company with a good reputation is far better than making an uneducated guess and buying a product you regret from a sub-par manufacturer altogether. Yes – we promote and like the idea of buying American made for all of our firearms whenever necessary, but limiting yourself can end up handicapping you as well. 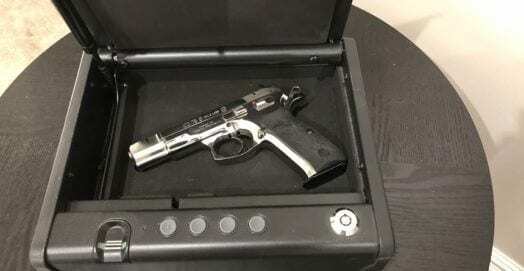 One of our editors ran with a Ruger SR9 handgun for four months before switching to a more expensive CZ 75 SP-01 tactical which ended up being a far better fit for him ergonomically even though it’s made in the Czech Republic. Bottom Line: Buying a Nikon, Bushnell or UTG is OK depending on your skill level or budget. Buy what you are comfortable with and practice, practice, practice. The type of AR 15 rifle you have can also help determine what kind of optic you should pick. 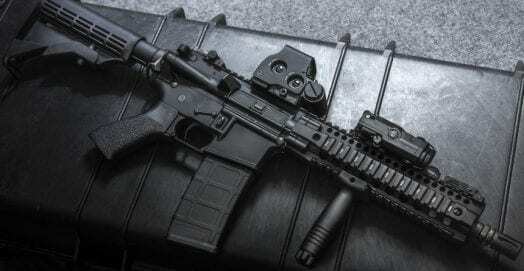 The type of AR-15 you have will also dictate the hardware you can equip it with. The good news is mounting a scope is easy on most modern ARs. 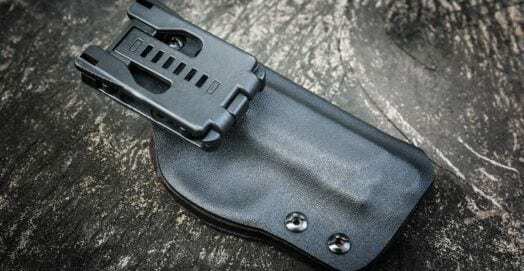 Unless you have an old-style Colt rifle with the carrying handle cast integrally with the upper, there will already be either a rail or fittings to mount one. The most common option today is a 1913 rail running the length of the receiver. Even if you do have a carrying handle it’s possible to mount a scope on it, but ergonomically that’s a nightmare – the sight line is far too high to get a good cheek weld and canting the weapon also becomes a significant accuracy problem. For hunting with an AR always go for a flat-top receiver with a rail. It also makes sense to look at the cost of your rifle. Unless you have put 10,000 rounds through your Bushmaster and just absolutely love it, why equip a $600.00 rifle with a $2,000.00 scope? Spend the money and upgrade the quality of your rifle first, then spend the money on the optics when it makes sense. As noted above, carrying handles like in the picture here to the right, can limit your scope options and make it less comfortable to shoot. There are plenty of flat top receivers and tactical rails that you can equip on your AR-15 these days to make them more flexible to equip. Bottom Line: We prefer a flat top receiver with a rail for most uses, especially for hunting. You can always buy a sling to carry it. Holographic sights are used primarily in close quarters combat. They are used primarily by military personnel and law enforcement agencies. They have also gained an incredible amount of popularity over the last few years as a close quarters sight for anyone that likes to hunt varmints at a closer range. The biggest advantage a Holographic sight has over a red dot scope is that the reticle is much bigger and the MOA is provides better range precision. The field of view is wider, but there is no magnification used in most holographic sights. You can purchase a magnifier that will allow the scope to function at a greater distance. 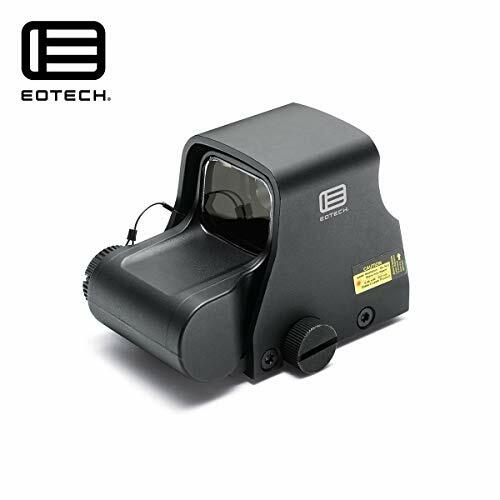 If you plan to stick to close quarters hunting or training, an EOTech Holographic sight should be your first choice. 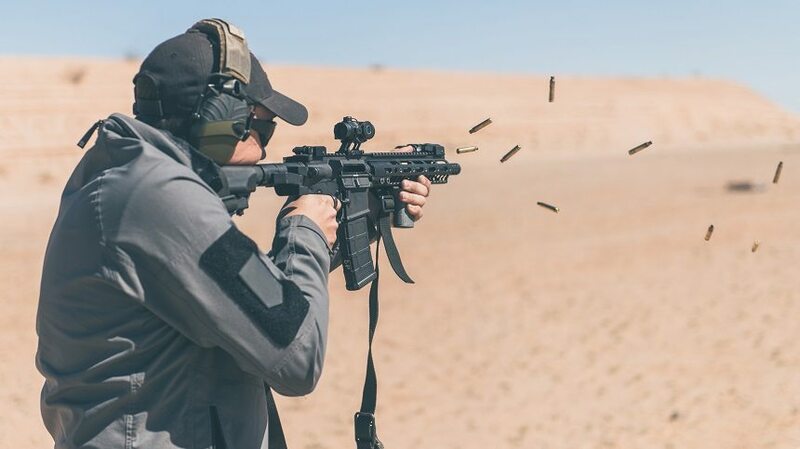 Keep in mind that EOTech is really the only true maker of holographic sights on today’s market – most others are red dot scopes designed to look like holographic sights. Let’s look at our Top 3 EOTech picks. 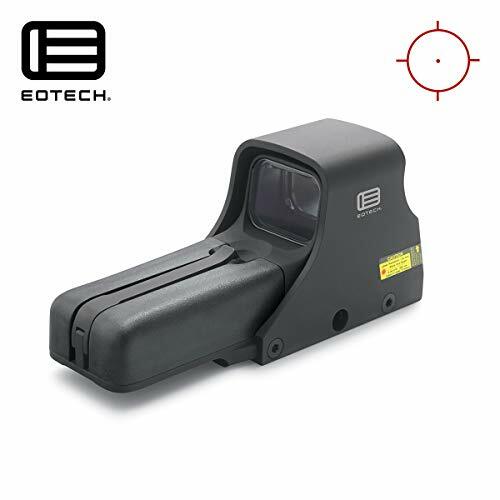 The EOTech 512 has pretty much set the standard for Holographic sights. If you can afford it, you won’t get a better holographic sight for the money. EOTech is made in the USA, which as we’ve stated – we prefer to support American made companies. Equipped with unlimited eye relief, you can get as close as you need to the scope without worrying about any eye gashes from the recoil. We still wouldn’t recommend putting your face right up next to it, but you get the point – EOTech gives you some flexibility. The Field of view is 30 yards at 100 yards at 4 inches of eye relief. This is more than enough to allow you to be comfortable hunting varmints at close range or training for any type of urban survival scenario. There are 20 different brightness settings allowing you to pick whatever is most comfortable for whatever your application is. The 512 boosts accuracy and improves target acquisition at a much quicker rate than standard conventional iron sights. The 512 is EOTech’s most popular model for a reason – it’s battle tested and the clear cut #1 choice for anyone that can afford the cost. The XPS2-0 is basically the same as the 512 and has the same features but is square and takes up far less rail space. This allows you to easily co-witness with Iron sights. The XPS sits lower than the traditional 512 and weighs less as well. 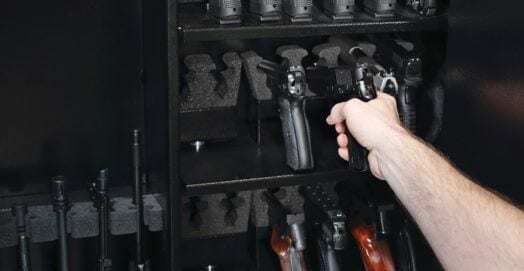 This makes your AR-15 more compact than when you run a traditional 512. The battery compartment is also more reliable and easier to access. The battery position is also more resistant to recoil impact due to the location, making it slightly less prone to damage. With the reduction of real estate it occupies on the rail of the rifle, this allows more flexibility if you choose to buy a magnifier that will extend the range of the holographic sight out further. Ultimately you need to decide which is more important – size and technology over the reliability and stability of the older 512 which has been tested many times over. The 512 also has AA batteries making it slightly more compatible in a survival situation where you may not be able to find less compatible batteries. We like the HHS I (Holographic Hybrid Sight) with the 3x magnifier due to the fact that it takes the guesswork out of buying a magnifier for you. No research needed, just pick the two of these together and run your rig. The reticle is specific to .223 caliber munitions making it the perfect pair to an AR-15 for anything from close to mid-range. 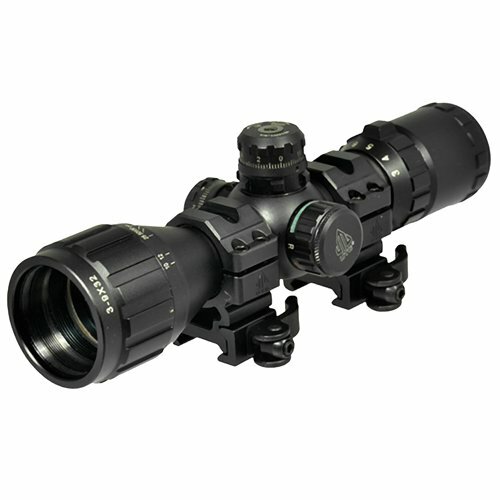 The shortened base of the HHS also provides more rail room and is night vision compatible making it a powerful package. The HHS allows for a true “two eyes open” shooting experience while getting the 3x magnification of a shorter range scope. The base is 7mm raised which means that you can still have room for iron sights, even with the magnifier package installed. Battery life is 600+ hours on the middle-range settings making it one of the top of it’s class in battery life. The most interesting part of the scope is that the magnifier “flips” to the side making the holographic sight a great stand alone application for close quarters hunting or tactical training. Decided that a red-dot scope is what you want? Navigating this maze is difficult, but there’s a few stalwarts out there that seem to hang tough even when new technology is released. Red dot optics are completely different than EOTechs, which are holographic sights. If you are looking for a holographic sight, then EOTech should be your choice – but there are a few “red dot” optics that are definitely worth a look if you don’t have the budget for an EOTech, or if you have the budget for a top end red-dot optic like the Aimpoint Pro. The choices below are some of our favorites in the red dot category and it’s hard to go wrong with any of them. Aimpoint’s PRO is the most expensive sight here, and there’s a reason for that. It’s a fully mil-spec scope, designed for military versions of the AR-15 platform, and it’s outstandingly high quality. The price might seem high for a non-magnifying red dot sight but if you’re planning on snap shooting at close range, and want a scope that’s as close to indestructible as you can get, this is the one. At only 4.5 inches long, and weighing 11.6 ounces complete with mount, this is an extremely compact device. It’s also as rugged as it gets, with a high-grade aluminum body anodized in black or coyote. 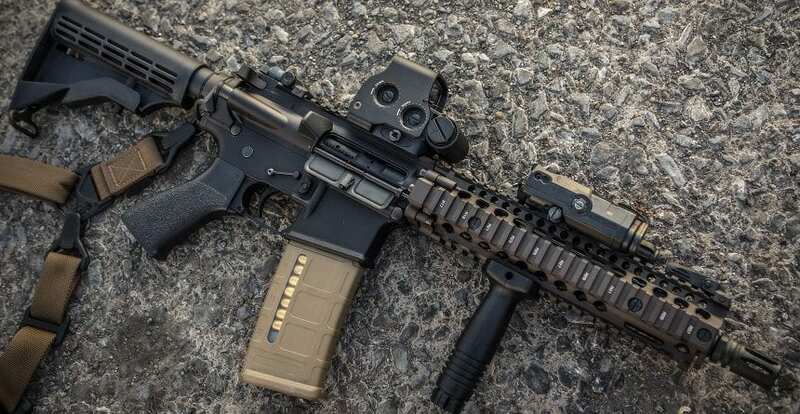 It comes with a mount, which has a removable spacer; use the spacer to get co-witness with the iron sights on a flat-top AR, or remove it for a lower profile on weapons that don’t have a straight-line stock. The mount itself is rock solid and has a large knurled knob for quick release. This sight has soaked up a lot of combat experience, which can be seen in the clear rear cap. If you need to take a shot and don’t have time to flip up the built-in caps, you can still see the red dot through the rear one; with both eyes open your brain will superimpose the dot on the target and you can still get the shot off accurately. If you’re predator or varmint hunting in dense cover that’s quite a handy feature. Optically this is very bright despite its 26mm objective; the lenses are high quality and very well coated. 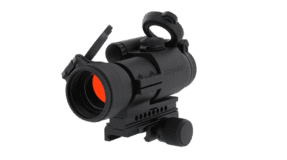 The reticle is a 2 MOA red dot, with ten brightness levels; four are night vision-compatible. You can also mount either an Aimpoint 3x magnifier or a night vision module in front of the scope to extend its capabilities. Aimpoint have opted for an always-on illuminator, but with a three-year battery life that isn’t a problem and it means the dot is always lit when you need it. The battery cover and adjustment caps all have retaining lanyards to prevent loss – the attention to detail is just incredible. It might have a high price tag but the Aimpoint PRO is excellent value for the money. 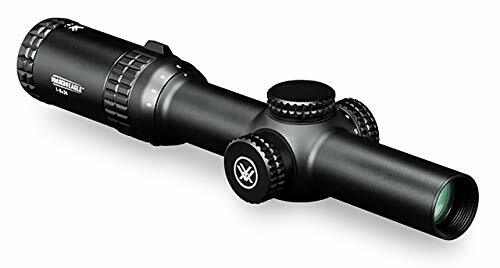 Another tactical-style scope, this one is even more compact than the Bushnell; it’s 5.6 inches long and weighs just 7.2 ounces. It’s also a non-magnifying sight and it’s heavily optimized for close range shooting. The cantilever mount lets you co-witness the iron sights on a flat-top AR, and it’s also compatible with night vision equipment. Eye relief is non-critical and this is a very easy scope to use with both eyes open. It’s ideal for dealing with fast-moving critters at shorter distances. The StrikeFire II has a 30mm tube, so if you want you can change the cantilever mount for another single-ring one. It’s well sealed and waterproof, and feels very sturdy for such a light unit. With no magnification and a 30mm objective lens you’d expect the StrikeFire II to give a good, bright image, and it doesn’t disappoint at all. The aiming mark is a simple red or green dot which has ten brightness settings. The dot itself has a 4 MOA diameter, so this isn’t your first choice for long-range paper punching, but it’s perfect for the sort of snap shooting the sight was designed for. Adjustment is through clicky turrets with half-MOA increments. A nice feature is a 12-hour auto shutdown on the illuminator, so if you forget to turn it off when you’re finished hunting it won’t kill the battery. The Vortex StrikeFire isn’t at all expensive for a tactical scope, and it really is impressively small. It also comes with a quality mount and built-in flip caps, so it works out to be a great value sight. The Bushnell TRS-25 is the original budget red dot scope. It’s the perfect short range red dot scope for a beginner on a budget, and is one of the most widely purchased beginner optics for an AR-15 on the market today. This is a great scope if you are just starting out and are looking for something basic. One of the reasons we love the TRS-25 is that it also doubles up as a red dot scope for other firearms you may use. You can easily toss it on a shotgun if you plan to do some small game hunting on the weekend at a closer range. Some shooters even choose to mount the TRS-25 on their handguns to get a better aim for competition shooting. This is one of those few areas where “you get what you pay for” actually goes the extra mile. If you are just starting out or even if you are an intermediate shooter on a budget, the TRS-25 has several features that are useful for a budget friendly option. One of the main benefits is that the scope can be used with both eyes open and the eye relief is unlimited. 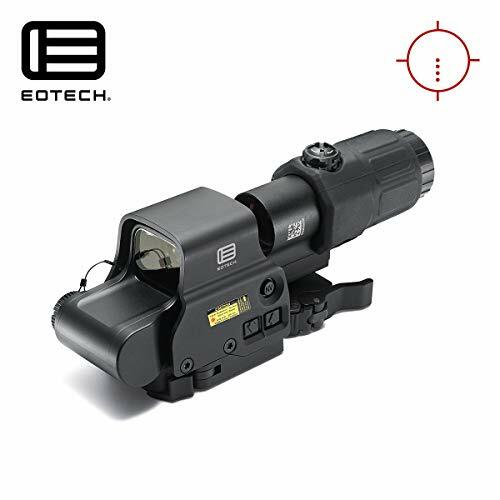 It operates about as closely to a EOTech as you are going to get without the hefty price tag. It mounts up to any Weaver style rail or Picatinny rail. The TRS is 100% waterproof/shockproof/fogproof, making it a durable optic. Bushnell may not be on the same quality level as Trijicon or Leupold, but this is a solid red dot unit for a fraction of the cost of some of the more expensive models. The Sightmark is in the “middle of the road” rifle scope bracket when it comes to quality. It has a few things going for it like the fact that the battery life is good and it’s waterproof up to 40 feet. Like the EOTech 512, it has unlimited eye relief, making it the perfect application for an AR-15 in close quarters. It has a digital switch control with 12 total settings. Half the settings are for use during the day, the other half for when there is minimal light. The shock-proof frame will withstand recoil from up to .50 caliber rifles, making it extremely durable. 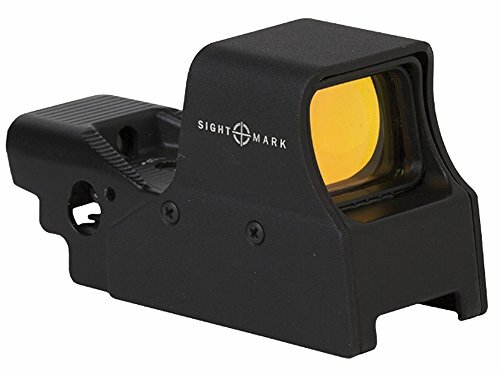 The Sightmark sight is a great option if you are looking for a “jack of all trades” budget holographic sight. It can be used for competition, hunting and tactical needs. While we still prefer the bells, whistles, quality and manufacturing base of the USA for the EOTech 512, the Sightmark Ultra Shot is a great value holographic sight for the money if you are on a tighter budget when buying a sight. This is much more of a tactical style sight and it’s very different from a conventional hunting scope. It’s a non-magnifying 1×32 unit designed for rapid target acquisition at closer ranges. If you want to do some varmint control around a farm or in the woods this is basically made for the job. Bushnell have packed the sight into a cast aluminum body that’s just 6.75 inches long and weighs 15.6 ounces complete with integrated Weaver rail mount. It’s nitrogen-filled, fully sealed and shockproof – in fact it’s amazingly rugged. 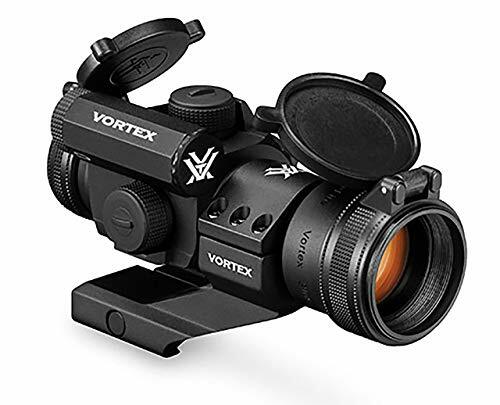 Emergency battle sights are cast into the top of the body; these are a military feature designed for use if the scope breaks – they first appeared on the British Army’s SUSAT Trilux sight – but they’re also handy for snap shots at close range. The scope itself is amazingly bright – the 32mm lens pulls in all the light the non-magnifying lenses can use – and gives a clear, distortion-free picture. Aiming is done through a T-bar reticle with a central dot. You have a choice of red or green illumination and the dot itself can be adjusted from one to ten MOA. That lets you choose between pinpoint longer-range accuracy and a bold dot for rapid aim closer in. If you want a very compact scope for close to mid-range shots this is a very good choice. The cost along with the features the MP packs make this a great value for any shooter looking to improve their accuracy. As we discussed – if you are on a budget and need to look at optics on the cheaper side, don’t be afraid to give the top picks made by Burris or Nikon a try. These are decent scopes, especially for beginners to intermediate level shooters. If you are just starting out, you should be focused on range time, iron sights and a cheaper scope if you buy one. You shouldn’t be focused on spending all your hard earned cash on an optic unless you plan to grow into it. Nikon optics shouldn’t need any introduction; their quality is well known. That applies to scopes as much as to camera gear, and the P-223 adds a generous dose of innovation as well. This series is designed specifically for AR-type rifles, and Nikon have put a lot of work into creating a scope that’s both compact and highly effective. The P-223 Carbine has a conventional hunting scope layout, but manages to pack a 3×32 format into a unit that’s just 8.1 inches long and weighs 12.2 ounces. That makes it ideal for short, light ARs – you can add a very impressive optical capability without much impact on handling. The P-223 Carbine has very impressive build quality, as you’d expect from Nikon; the tube is waterproof, shockproof and nitrogen filled, while the optics are fully multicoated to give very good light transmission. The 32mm objective and low magnification produce a bright sight picture, too, although the 3x power is best for shots at under 300 yards. It does give a wide field of view, and the picture is distortion-free right out to the edges. Nikon equipped this scope with a bullet drop compensating reticle calibrated to the .223 round; the main crosshair is set up for a 200-yeard zero, with additional marks for 400 and 600 yards. The zeroing turrets are large and easy to use, with positive quarter-MOA clicks. If you’re looking for a solid, affordable, compact scope, for mid-short range shooting, this is a solid budget pick. You could argue that this should be in the red dot category, but this little scope combines red-dot technology with short range distance magnification. 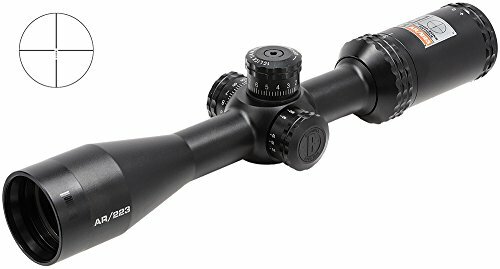 Designed for .223 rifles, this slightly larger tactical scope adds 3x magnification and some more reticle options; it still works competently at close range but can push out a lot further than the StrikeFire II. It’s also more expensive, but that reflects its quality and features. 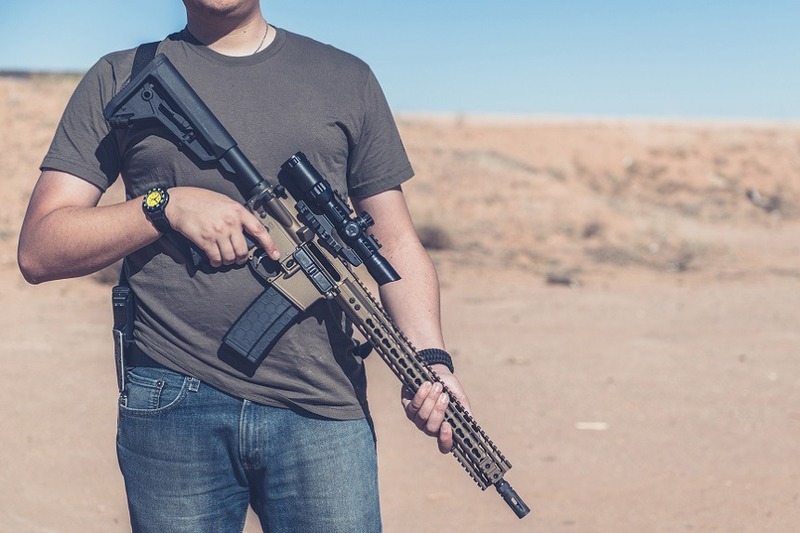 Vortex have created the Spitfire with the AR-15 platform in mind, and they’ve done a great job of cramming stacks of performance into its small body. The scope is just 5.5 inches long and weighs 15.4 ounces – this is a very solid piece of equipment. The secret to its performance is the optical design – instead of lenses the magnification work is done by a prism, allowing for the same performance in a much shorter optical path. The reticle is etched directly onto the prism, so there’s no chance of breaking it without destroying the whole scope in the process. The reticle itself is the EBR-566 Enhanced Battle Reticle, with a partial aiming circle round the top of a vertical line. The upper part of the line is marked with aiming points for ranges out to 500 yards – a long shot at 3x magnification, but this aiming system should cope. There’s a choice of red or green illumination at five different brightness levels. Its 30mm objective lens gives the Spitfire a very clear, bright image and a wide field of view. Adjustment is by half-MOA increments through elevation and windage screws with protective caps. A fast-focus eyepiece lets you get the reticle nice and sharp. 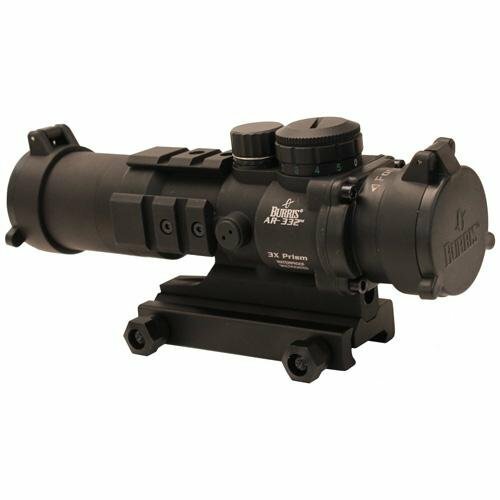 This is a very solid and highly capable compact hunting scope that operates out past the maximum responsible hunting range of a .223 AR-15. Trijicon. That word sends fear into the pocket books of some of the most financially secure shooters out there. 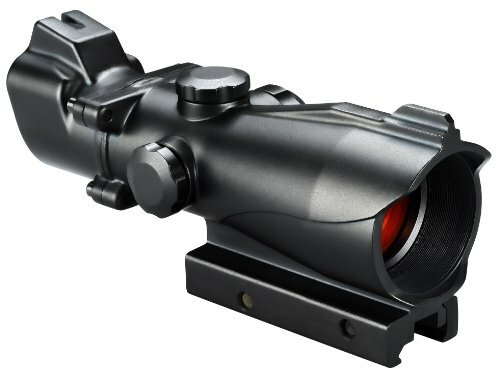 ACOG stands for “Advanced Combat Optical Gunsight.” Trijicon ACOG scopes are used by many military and law enforcement personnel for advanced tactical training. Make no mistake – this scope is for people who’s lives may depend on their rifle at some point. The bottom line is if you want the best, you have to pay for it. Some people have a hard time justifying spending as much money on a scope as they probably did their rifle. 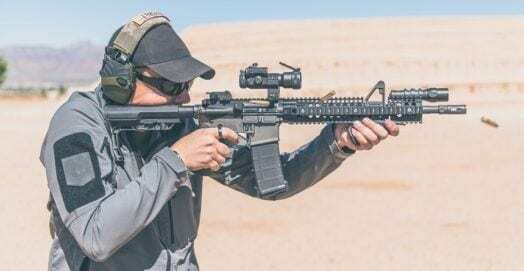 But if you are the type of person that’s built their own AR-15 and spared no expense, or the type of shooter that just likes to buy the best, the Trijicon ACOG 4×32 is worth it. The ACOG 4×32 operates battery-free and has a day/night illuminated Chevron. This acts as the same way as a dot scope would, without worrying about the battery. The Fiber Optics provide daytime illumination and a tritium phosphor lamp provides nighttime illumination. 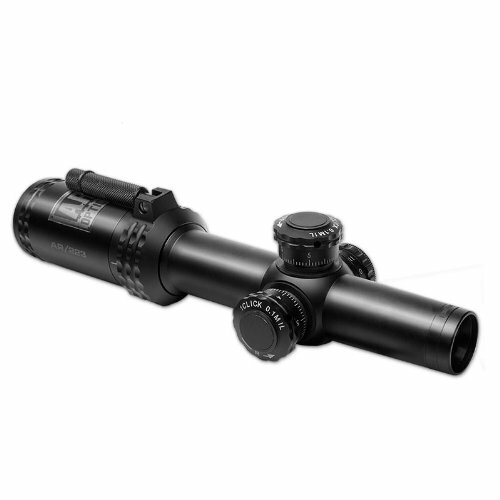 The scope is made of military grade aluminum and is both waterproof/fogproof. The tritium lamp that provides nighttime illumination is warranted for up to 15 years and the Trijicon lifetime warranty is something only the best in the business provide. The Trijicon ACOG is a tactical combat scope. It is meant for training at 400 yards and closer in. It’s not meant for long distances and again, if you are a beginner – save the money here, get a Nikon 3×32. Then get to the range and practice as much as possible until you are comfortable with your rifle. If you are an advanced shooter and can afford the price tag – you probably already know what you are getting by picking one of these up. What we don’t: Nothing but the price – yikes! We’ve added the VCOG to our list (VCOG stands for Variable Combat Optical Gunsight) because this is the yin to the ACOG’s yang. While the ACOG is best for short to medium open range distances, The VCOG is something that can “do it all.” The power ranges from a variable 1x to a 6x with a couple easy clicks, making it adaptable and more evolved. The VCOG comes with a hefty price tag, but is well worth the cost for people that depend on their scope for advanced tactical purposes. While we have this scope in our “short range” category, it can easily function as a medium range scope if you are good with the smaller objective that the 24mm diameter offers. 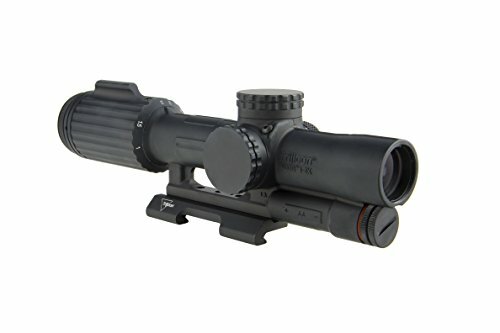 This scope is excellent for any type of tactical training and is used by many members of the military. Eye relief is at 4 inches, which is a little further out for some people, so that’s worth considering if you are looking for a scope without relief limitations. One of the biggest pros that this scope offers is the amount of abuse it can take without losing it’s zero. It’s designed to take a beating and stay true to the target even through intense conditions. If you are looking for what’s considered to be the best scope on the market today, the VCOG is your answer if your wallet can handle the price tag. Keep in mind that this optic is probably a better fit for people that are more advanced in their firearms training. As we’ve emphasized before, training with your AR-15 and iron sights or a cheaper scope should be your first priority if you are a beginner. Vortex Optics have made a name for tactical-style scopes, but if you prefer a more traditional look with the same technology built in the Strike Eagle looks like an attractive option. It’s still compact, too, and its zoom capability makes it a great all-rounder. Designed for the AR-15, it guarantees fast target acquisition at all ranges and pinpoint accuracy. The Strike Eagle is built around a standard 30mm tube, machined from a single piece of aviation grade aluminum. The tube is nitrogen-purged and fully sealed, so you shouldn’t be bothered by fogging; the lenses are fully multi-coated to minimize reflection and make the most of the light gathered by the 24mm objective. With the scope being tailored for the AR Vortex have fitted it with a bullet drop compensating reticle calibrated to .223 rounds. A three-post system surrounds a central illuminated aiming mark, which features a partial circle for snap shots and a vertical line graduated in 100 yard increments for easy holdover. The range lines go all the way out to 600 yards, and in good light this scope will handle that very competently. The reticle itself is etched into the glass for durability; there’s no chance of it breaking under the stress of repeated recoil. As you’d expect the weak point of the Strike Eagle is in low light conditions, but the zoom range helps compensate; drop the magnification to 3x or lower and you can keep shooting well into the twilight. Vortex have gone for traditional adjustment screws with protective caps, rather than turrets. This keeps the scope’s profile low, and the reticle means there’s no real need to dial in adjustments once you’ve zeroed. The focus ring is standard, mounted at the front of the eyepiece, and has a large stud for easy operation. 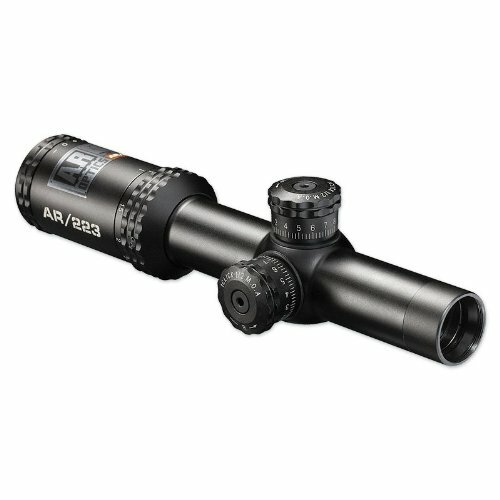 Overall this is a very high quality scope that easily justifies its the price. 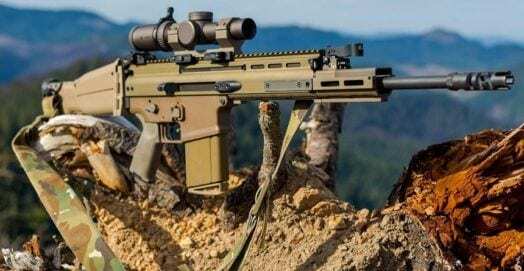 Another tactical sight, the Burris AR-332 is a 3×32 format designed for military and law enforcement use – but it’s also great for close to mid range hunting. This is a high quality scope with a lot of useful features, and it deserves a close look if you want to put together a good all-round AR. 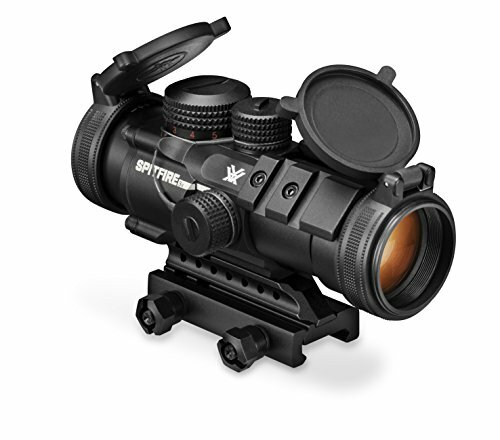 It technically qualifies as another red dot scope, but we like it for short-distance due to the magnification power. The AR-332 is 5.3 inches long and weighs 14.2 ounces, including the 1913 rail mount. The body is sturdy and cast from aircraft-grade aluminum, with a tough anodized finish. The top and sides of the body are fitted with short 1913 rails, so you can fit lights, lasers or even a CQB sight. Controls consist of two zeroing dials that work in half-MOA increments, and a large rotary knob to manage the illumination. The scope has a choice of red or green illumination, with five brightness settings for each. Burris have equipped the AR-332 with a BDC reticle, consisting of a large quick-acquisition ring surrounding a cross with central aiming dot. The lower arm of the cross is made up of holdover dots calibrated to the .223 round out to 600 yards. The reticle is extremely easy to use and is highly visible in all conditions. This is a very competent tactical scope, rugged enough to last a lifetime and offering excellent performance in all conditions. A combination of a bright, clear image and well laid out reticle makes for accurate shooting to the AR-15’s full range, and it’s still light and compact enough to give you a manageable rifle. Another scope designed specifically for the AR-15, this compact Bushnell is ideal if you’re looking for a high quality scope that adds the bare minimum of bulk to your weapon. It’s a diminutive 1-4×24 unit, but its small size doesn’t get in the way of performance. This is no light bucket, but it can still be effectively used in low light conditions. Bushnell kept the Drop Zone-223 usable by going for relatively low magnification; even with the small lens you can get a bright picture in moderate twilight at full power, and dropping the magnification to x3 will keep you shooting as long as there’s any daylight at all. Although it’s small – 9.1 inches overall – the Bushnell is solidly built from aviation grade aluminum, weighing in at a chunky 16.9 ounces. The tube is nitrogen-filled and well sealed against moisture and dirt, with a tough anodized finish. The BDC reticle is calibrated to .223 caliber, with a 100-yard zero and aiming marks every 100 yards out to 500. The zeroing turrets are target style, with 0.1-mil increments. A tenth of a mil is about 0.32 MOA, so it’s slightly less precise than the other scopes, but the difference is insignificant. This is a very neat little scope that performs much better than its size suggests. 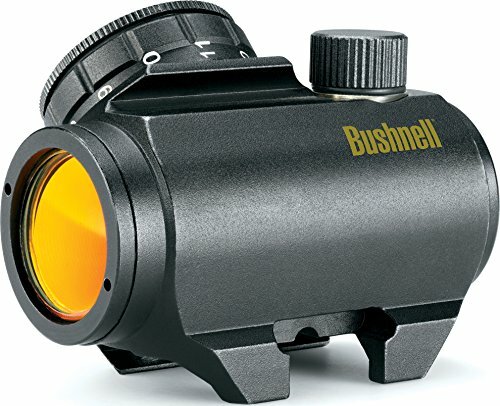 If you want a compact hunting optic and you’re happy to lose some magnification in twilight conditions this Bushnell will do a great job, especially for beginners with a small budget. One drawback of smaller scopes is that the sight picture is less bright around dusk and dawn. That can become a problem – often you can see the target, but the reticle is hard to make out. To let you make those shots Bushnell have produced an illuminated version of the 223 1-4×24. This is basically the same scope, but with a red illuminator added to the reticle. A very nice touch is Bushnell’s new illumination control system – there’s a throw-down lever mounted on top of the eyepiece that lets you change the reticle brightness very quickly. This is the perfect sight for anyone who prefers a small scope but wants to get every available scrap of twilight performance out of it. Medium range optics are where we really start to differentiate the optics choices for a tactical rifle. It becomes more difficult to use them up close, especially with eye relief starting to come into play. If you are a beginner, you should be looking at the shorter range scopes or the red dots to start you off unless you know you will be hunting or using your rifle at a medium distance (think 200-400 yards out). These make a great pairing if you plan to run a dual scope setup where you swap out for longer distances. 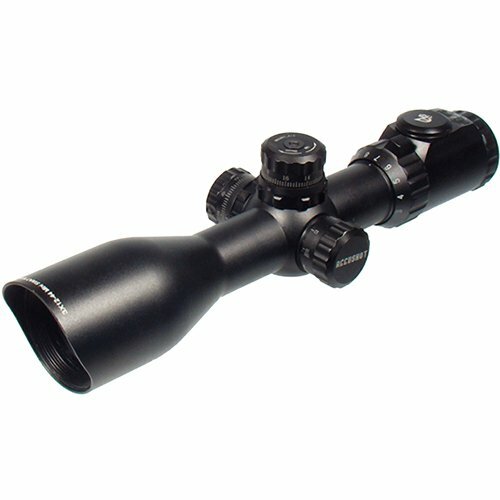 Most of the effective “one size fits all” type scopes for beginners are in the short range category. The scopes below are all great for medium distance use, and are extremely valuable if you plan to take your AR-15 hunting small game. The Prostaff 3-9×40 is another great example of Nikon quality. 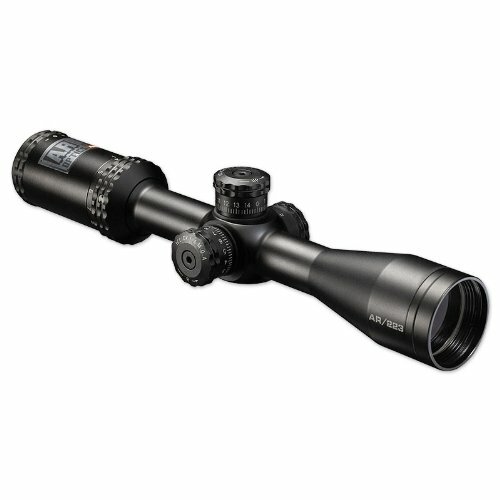 This is a versatile hunting scope that won’t break the bank, but gives you excellent optics and solid build quality. The Prostaff range is extensive and contains a wide variety of scopes, but for hunting with an AR-15 the 3-9×40 zoom model is the prefect jack of all trades. Its 9x maximum zoom is perfectly adequate out past the limits of the rifle’s range, and the lens gives good light-gathering capability without too much of a weight and bulk penalty. It’s also a rugged, simple scope with not much to go wrong. 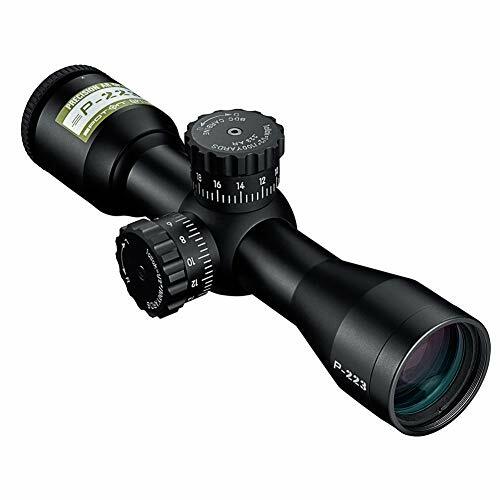 For a scope with these specifications the Prostaff is pretty compact, at 12.3 inches long and 13.7 ounces. The optics are multicoated, and the tube is shockproof, waterproof and nitrogen filled. Zeroing is through screws under protective caps; adjustment is in quarter-MOA increments and has a nice positive click. Zoom from 3x to 9x power is controlled by a ring in front of the eyepiece and is easy to operate. Inside you’ll find Nikon’s BDC reticle, with a series of range circles that allow you to quickly aim off for distance. The sight picture itself is clear and bright; in twilight conditions you can easily use up to 5x magnification. This scope is easily capable of handling shots out to the AR platform’s full effective range, and makes a great choice for hunters who want a usable zoom capability. If you like the features of the little Bushnells, but want more magnification and light-gathering ability, this is the scope for you. It has the same rugged construction and quality optics, but nearly three times the objective lens area and a higher zoom range. On this sight Bushnell have reverted to quarter-MOA clicks on the very precise turrets, and they’ve also added a parallax turret on the left of the tube. Combined with the rapid focus eyepiece and a nice smooth zoom ring, this all makes for a scope you can set up quickly and easily – and it holds its zero once you’ve dialed it in. The larger lens gives you a much brighter picture in low light conditions than its little brother, and that makes the extra weight and bulk worthwhile – this scope is 12.2 inches long and weighs 21 ounces. It’s outstandingly solid and feels like it’s worth a lot more than most optics in this quality range. If you don’t mind running a 2 scope setup, with one for medium to longer distances and a red dot or holographic sight, then the Bushnell Drop Zone is a perfect pick. If you’re looking for a budget scope that’s still packed with features the UTG BugBuster is an excellent choice. 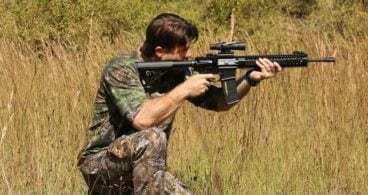 It is compact and has all the capability you need to turn your AR-15 into an excellent hunting or tactical rifle if you don’t have a lot of money to spend. The Bug Buster has a rough, sealed tube that’s filled with nitrogen to eliminate internal fogging. The objective lens is emerald coated to maximize light transmission and the sight picture is amazingly good for this price – there’s hardly any distortion around the edges, and the Mil-Dot reticle is a great tool for both aiming off and judging distance. At higher magnifications the brightness did begin to fade, but that’s inevitable in a scope this size; at 4x magnification it’s perfectly adequate for shooting around dusk and dawn, and as light levels increase you can crank the zoom up too. The zoom ring has a large stud for easy use, and the settings are clearly marked on the tube. Zeroing is via large turrets with a similar zero-reset system to the Nikon’s. There’s also a third turret on the left of the scope which controls the illumination. You can select either red or green illumination for the reticle, which gives an outstanding sight picture in low light or against a dark target. Finally the BugBuster comes with a useful selection of accessories, including quick detachable mounts, a sun shade and flip-up caps. This all adds up to an excellent value package. Quality may not always be spot on, but for the price, it’s easy to replace if you encounter a defect 6 months down the road. While this wouldn’t be our pick if for major tactical operations, it serves the purpose of short-medium range hunting on a budget very well. 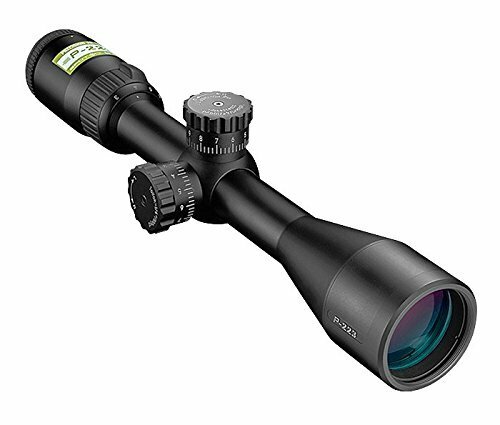 Offering higher magnification and better light-gathering ability than the BugBuster, with the same extensive range of features, this scope is perfect if you hunt a lot around dawn and dusk. It is a bit larger, at 14 inches long and 25.6 ounces, but the extra performance is worth it. The Compact’s 30mm tube is built on their True Strength platform to ensure it can take a few knocks without losing zero. It’s also nitrogen-purged and rainproof. Inside are emerald-coated lenses and the same Mil-Dot reticle as the BugBuster but with a more advanced, 36-color illumination system. This is controlled by the EZ-Tap interface, which consists of two buttons under a cover mounted on top of the eyepiece. It also has a memory function; you can adjust it to exactly what you need for a tricky shot, then restore the last setting used with a single click. As you’d expect from its larger lens the image is brighter than the Bug Buster and quality is just as good – meaning it’s quality yet budget friendly alternative. Zero is controlled by turrets with zero-reset and quarter-MOA clicks, while a third turret on the left allows easy parallax adjustment. Zoom is controlled by an easily operated and clearly marked ring. This scope has an integral sunshade above the objective lens; it’s supplied with quick detach mounts and flip-up caps. Overall it’s very hard to beat on value, giving you great performance in a quality package. Long range optics are for long range hunting/shooting. These are great scopes to pair with a shorter range option when running a dual scope setup with your rifle. 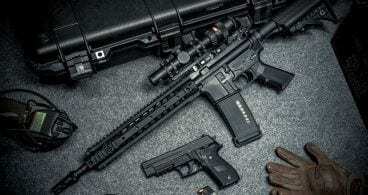 Overall, the selection is a little bit more limited because most people keep to the medium range with an AR-15 and save the long range hunting for other rifles. With that being said, any of the three scopes below can turn your AR-15 into a longer range varmint hunting tactical beast. Let’s dive in. If you prefer higher magnification than the Prostaff offers, this larger P-223 sight could be ideal. At 14.1 inches overall and weighing 17.5 ounces it’s still easily manageable, but the extra size and weight brings a lot of additional capability with it. 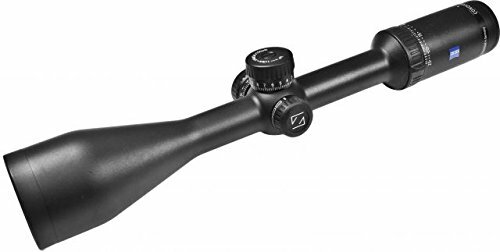 Again this scope has a rugged, waterproof nitrogen-purged tube and O-ring seals, and the lenses have the same multi-layer coating. The reticle is the BDC pattern, with a series of rings and hash marks below the central crosshairs to allow easy aiming off. As it’s in the P-233 series these marks are calibrated to the trajectory of a .223 round, which makes things even easier. Like the other Nikon BDC scopes it’s compatible with their Spot On app, which lets you enter your bullet weight and muzzle velocity to get a customized aim point/range table. Optically the BDC 600 is more than adequate. The sight picture is free from distortion, and while the brightness fades slightly at higher magnifications anything up to 5x is still perfect for twilight hunting. Zoom is controlled by the usual ring in front of the eyepiece, and a large stud makes it easy to rotate even with gloves on. Zeroing is via large clicky turrets that feature Nikon’s Zero-Reset system; you can adjust the point of aim for a tricky shot, then simply lift the spring-loaded caps to quickly return to your normal zero. 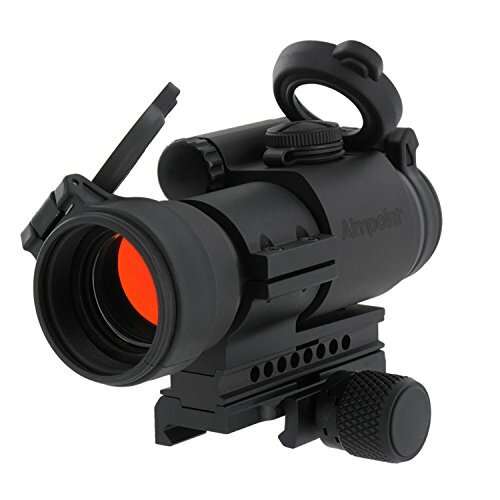 Overall this is a very capable scope that lets you fully exploit your AR’s range. Want more magnification? 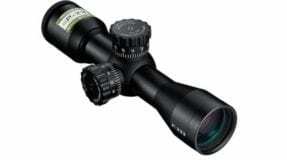 This scope has exactly the same construction and features as Bushnell’s 3-9×40, but extends the zoom upwards to 4.5×18. It’s aimed at hunters who make most of their shots at longer range, where the high maximum power lets you place your bullets with extreme precision if you have a stable enough fire position. Inevitably there’s a price to pay for this in light-gathering power; anything above about 8x magnification is for full daylight only, as the 40mm objective lens will struggle in lower light conditions. At low power it’s just as bright as the 3-9×40 though, so you can keep shooting as the light fades – you just won’t be able to use the full zoom range. It’s a more expensive optic, but if you do most of your hunting over open ground this scope makes a lot of sense. Here’s where the old saying “go big or go home” comes into play. There are plenty of people that will say a 50mm objective is too big for an AR-15. Then there are plenty of people that will tell you that the 50mm objective allows the perfect amount of light in to see hogs at dusk during hog season. It’ll be up to you to figure out which camp you fall into. The bottom line is this – the HD5 can be used on multiple rifles and has multiple applications at longer distances. The HD5 is much slimmer than other scopes with a 25x maximum power and 50mm objective lens. Again, the name of the game is pairing. 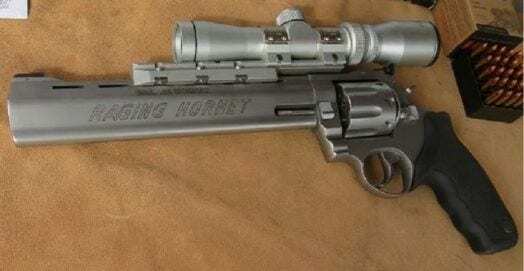 You won’t use this scope at close quarters, ever. But if you have a decent red dot scope already in your arsenal, Carl Zeiss scopes are some of the absolute best scopes in the business. The HD5 is the perfect pairing for long distance coyote or any other varmint hunting expedition. We’ve said it on more than one occasion in this article. Beginners need to focus on practice, practice, practice. If you just picked up your first AR and feel the need to pair it with the best AR-15 scope on the market, you are shorting yourself that money to where it matters most – ammunition and range fees to practice with your rifle. Stick to the budget scopes in the $200-$400 range and then spend your money where it counts. If you are an intermediate to advanced shooter and know your way around an AR-15, you’ll have free range of the AR-15 optics that best suit your needs and you should feel confident spending money where you feel the quality is. Chances are if you are someone shooting at competitions, you already have your scope picked out. If you’ve stumbled upon this article and feel we are missing something good for our readers, please feel free to drop us a line and let us know! EOTech 512 vs. Aimpoint Pro – What’s Better For an AR-15?